The very sunlike single star often plays a role in science fiction stories. It would be ideal for planets which could develop intelligent life. However no planets have been discovered so far. But Earth-sized planets we can't discover anyway at this time. Indeed there is a dust disk around Tau Ceti which contains a huge amount of comets and asteroids. 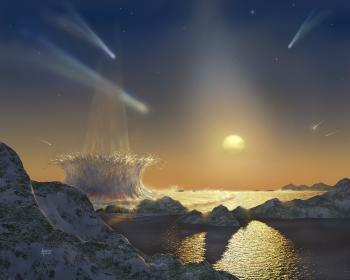 Artist impression of a planet around Tau Ceti.